Business relocation hacks just like any life hacks, are ingenious methods to untangle the complexity of any complex processes. They are insights collated by business relocation specialists to lessen hassle for their clients and minimise risks on every removal projects that they execute. Preparing for business relocation is just as intricate and difficult as the moving day itself. Some would even argue that it’s worse than the actual day of the move. No matter how much time you will allocate for preparations, if you don’t know how to do it right, then it will all be for naught. Gladly, there are 10 ingenious insights that may make things easier for you. Your office will not tidy by itself in the new site. Thus, you can’t expect the move to be easy. In fact, there’s no such thing as that when it comes to moving a whole company. But, if the layout for the new office has been laid out, the smoother it will be. The movers will be now more organised when the moving day comes. So, a couple months before your move, it’ll be best to finalise your layout for your new site. Numbers are less confusing than names and words. Although many will argue against that (especially those people who hate math), but for real—numbers will make things easier for you. This is where you develop a relocation system for labelling crates and boxes, space allotments, office assignments, and inventory. Although most companies will choose to keep the old floor layout that they had at the previous site, it would be worthwhile to consider revamping your floor plan. Especially that in most cases, spatial size and shape are different between the old locations and the new site. So, given if you are compelled to re-layout, then do it purposely. Keep collaborative departments close to each other. And tidy up the whole space allocation design base on the functions of your employees. Communal spaces are not really areas in your company that will bring you money. But never forget that you have human workers. Regardless of how much dedicated they are to what they do, they still need a stress-free space in the office. They will always have a need to recharge, reconnect and relax. So, never neglect the need to assign areas for these functions. This is more of a no-brainer tip than business relocation hacks. But then again, sometimes when you deal with too many difficulties, you lose track for common sense. So, we’ll include this anyway while we are the ones out of the box. Your floor plan will be for nothing if the movers are not briefed about it. You really don’t want them to just dump your possessions anywhere and leave. So, never forget to brief them regarding placement, order, and purpose. The last thing that you want to happen during the move is for your employees to lose morale. And believe me, hassle can take so much morale out of a sane person. So, be sure to give all of them the new address as well as every other significant information about the move. Packing and labelling always go together. If packing does not follow the same system for labelling, then chaos is imminent. So, assign a team to develop and educate everyone about the packing and labelling system. And with “everyone”, that includes movers and company employees alike. 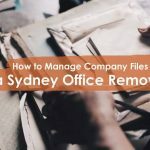 Considering that you may not have that much experience in moving companies as much as professionals do, we can offer you helpful business relocation hacks for packing, such as our previous post 4 office removalists Sydney hacks. You’ve paid movers for removal. But then, they are not as familiar to your office as your employees. All the more do they know which stuff belongs to whom. Hence, for safety and harmony during the move, let your own employees declutter and keep significant stuff such as documents, files and desk peripherals. Your employees can also see if they need a portable storage unit to store their items in the next site. In this way, they can fetch it when the move is all said and done. While they’re at it, if your employees have personal stuff in their desks and cabinets, it would be better for them to take them home for the time being. So, none of these personal stuff gets damaged or lost along the way to the new site. For who knows, no one is perfect. If all necessary preparations are done before the move, then the moving day would be so much easier. Although apparently, that does not completely preclude certain necessary tasks all the same. Nevertheless, there are still some more handy business relocation hacks that will ensure a successful move. As implicated previously, while the movers are expert when it comes to industry insights, it’s your own employees who are more familiar with your office environment, culture and arrangements. So, appoint an employee to significant areas of your office to supervise the movers as they do their job. Time is the enemy for an office relocation project. But then, trying to catch up to it may lead to damage and many other contingencies. Nevertheless, it would be great if you can collaborate with your removal company in planning the move. In this way, movers can spread out strategically in your office for a quicker transition. This is one of the many unique yet apparently, essential business relocation hacks. But if you reanalyse its purpose, you will see that it makes sense. The internet is a great means of communication whilst electricity will help in many great ways post-removal. It’s better to be safe than sorry. So, ensure that the new site is fully up and running. If you have a trusted employee that is keen enough for the job, might as well bring him/her along with you as you do your triple checking rounds. The new office holds the future of your company. This is where you will start yet another chapter in your business’ biography. Ensure that all your assets get there safe. And while you’re at it, might as well make sure to find ways to uncomplicate the undertaking. Use these business relocation hacks and move with ease. Then let your business partners know about it too or any friends in your circle. To find more insights that will make your move even better, check on our services and blogs section. Also, get the right expectations on the process and read our article: Expectations in Hiring Office Movers Sydney.